Playpens are a great product to give your baby or toddler somewhere to play in that will keep them safe as well as entertained. As soon as your baby starts to move about, they can risk getting into dangerous situations or getting hold of non-child-friendly items if you leave them unsupervised. 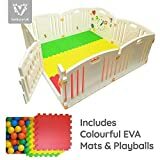 So that you can pop to the toilet or make a drink without having to take your toddler with you, how about getting a playpen? 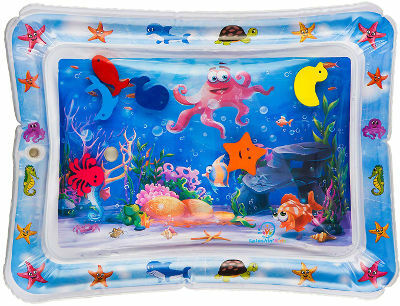 They can be popped into the pen with a few toys to keep them occupied while you get lunch ready in the next room. Play pens are also really useful when you go outside or away on holiday. You can use a pop up play pen with a play mat out on the grass to keep your baby exploring a safe area of the garden. On holiday, they can be used to keep your little one safe if where you’re staying doesn’t have any baby proofing in place. 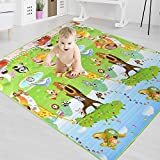 These play pens and play mats are all found in the Amazon Best Seller lists so you can be assured that they are the most popular products with customers just like you. 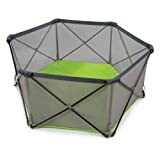 This playpen is a really handy foldable one that can be easily set up and put down for those quick moments that you need to pop your baby into a playpen for a few minutes. 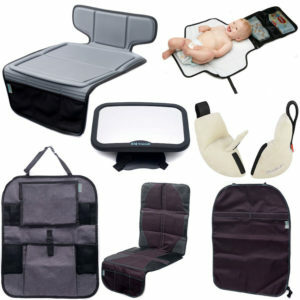 The ‘pop-up’ nature of the playpen also lends itself well to taking with you on holiday or when visiting family. 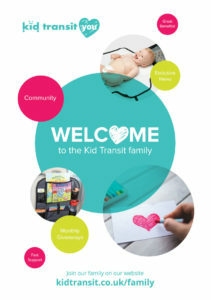 The playpen comes with it’s own bag for easy transport and storage.Walls are mesh for ventilation as well as visibility and one side has a zip for easily access to your baby. If you want a more permanent playpen solution that can also be used as a room divider, then take a look at this playpen with activity panel. The non-toxic plastic panels easily push fit together to create a large space for your child to play in. The panels can be configured in different ways to get a pen at the size you need to fit your room. One panel is a dual-locking door so you can easily get in and out of the playpen but your child can’t. 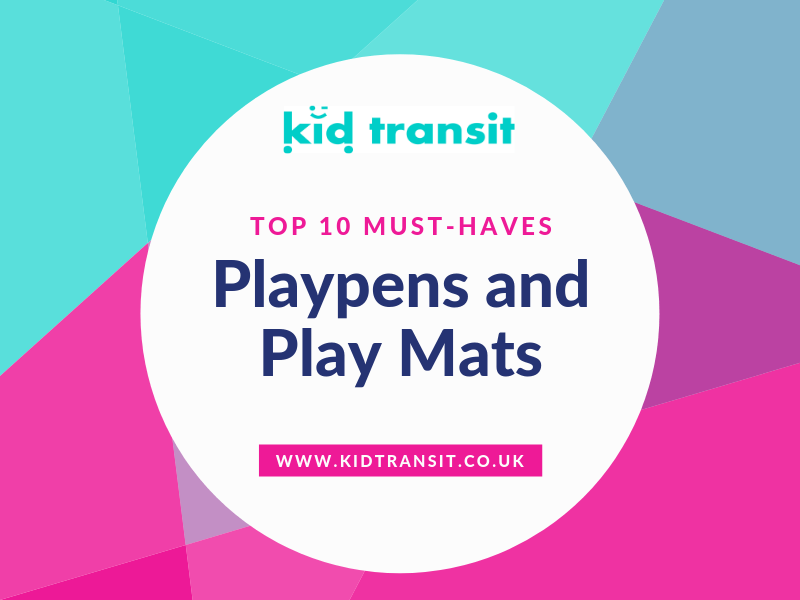 The playpen also comes with a fun activity panel, floor mats and balls to make playtime even more exciting. This is another ‘pop-up’ playden that gets loads of great reviews on Amazon. 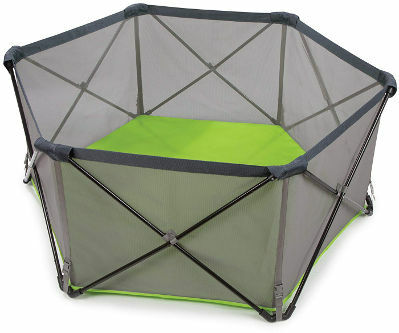 The playpen easily folds and unfolds to make a safe playing environment for your little one in a matter of seconds. 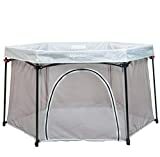 The playpen has a built in base mat so it is perfect for using outside when you don’t want your baby crawling on dirty ground or getting sand everywhere at the beach. The handy storage bag has a strap for easy carrying. 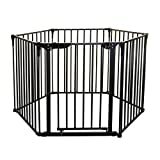 The BabyDan playpen is a more traditional style one that has metal bar panels to form the playpen. One of the panels is a door that allows you to easily put your baby or toddler in and out of the pen. 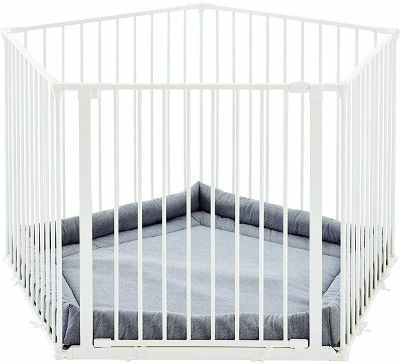 The playpen can also be configured as a room divider and a fireguard depending on how you have your home set up. 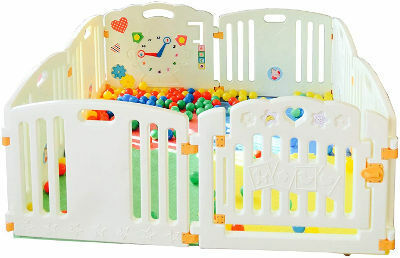 To keep your child comfortable, the playpen comes with a machine washable play mat to sit on. 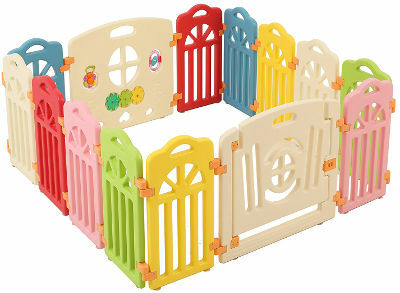 This colourful playpen has easy to push together plastic panels to make a pen to suit your home. The fun panels are narrow in width so you can easily change the shape and size of the pen depending on what room you need to set it up in. One panel is a child-safe door and a final panel has a few activities built in to keep your child entertained. Extension packs can also be bought for this playpen if you have a bigger area for your child to play in. 14 Panels include 12 Colourful Side Panels & 1 Door Panel & 1 Interactive play panel. The 3 in 1 playpen from Dreambaby can be used as a straightforward playpen, a room divider and a wall mounted fire guard to keep your children safe. One of the metal bar sides is a childproof door so you can easily move your baby in and out of the playpen. 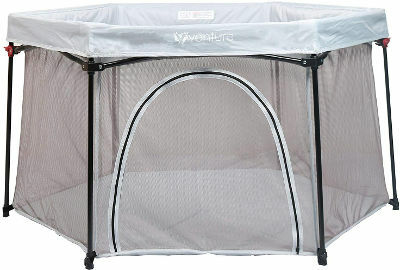 Additional panels can be bought for the playpen so you can expand the size to fit your available safe. If you are looking for an easy to use play mat to make a hardwood floor more comfortable for your child to move about on (and to give some protection from dropped or thrown toys) then these interlocking foam squares are a great buy. 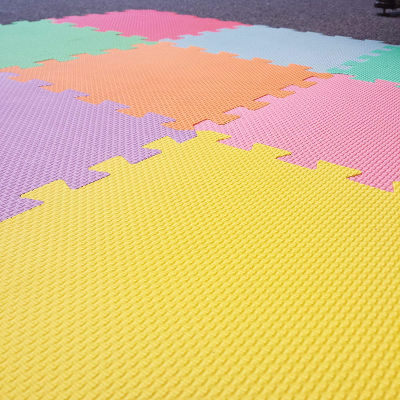 In fun colours, the squares easily fit together in whatever configuration you need to provide a wipe clean, soft, play surface. Once your child has finished playing, they can be picked up again and stored away for next time. A play mat with a difference, this is all about encouraging tummy time fine with your young baby. The mat encourages your baby to play on their tummy, thus improving their motor skills and strengthening muscles. 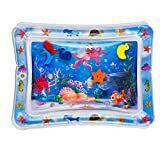 A fun underwater scene filled with water will keep your baby entertained and exploring the different animals and textures. The mat is easy to fill and deflate, making it perfect to pack up and take away with you. 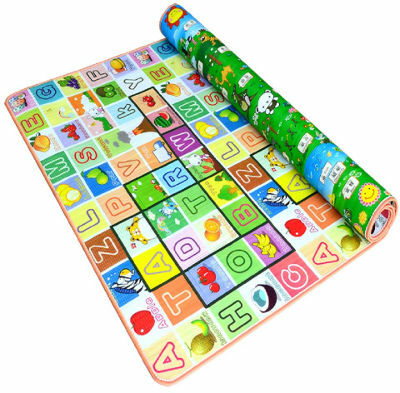 This soft, two sided play mat has a fun design on either side to stimulate your child into imaginative play as well as protecting their hands and knees as they crawl around. One side is a fun woodland animal scene and the other is an educational alphabet to encourage learning. The mat is light enough to roll away and store at the end of the door, or can be left out permanently as a colourful rug. Made of 100% non-toxic and odorless, environment-friendly and healthy,come with a bag for storage, is it easy to fit mat into it. 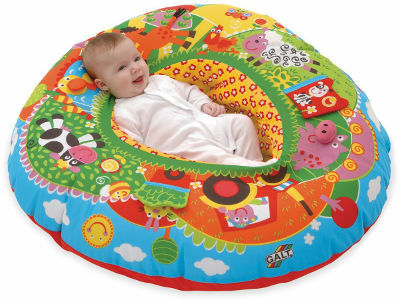 A play nest is great for when your baby needs a bit of extra support when on the floor. This one from Galt Toys has lots of little toys attached to the nest to encourage sensory development and play from birth. the inner ring is inflatable to the desired level of support and can help with your baby lying or sitting depending on what stage of development they are at. The nest cover is machine washable so no need to worry about spills.